Was there. Well until BS started... I think more than half of the audience just got up and left. Yes with Wakeman and Bruford might have been successfully followed by the Beatles... Maybe. Or King Crimson. For that concert their musical format and stage presence were stunningly perfect. I was there Warren, I do not remember it being any louder than normal. Grand Funk was the loudest concert I went to; my ear rang for three days. This is more of a question than a review. I was just curious, was this concert extremely loud? My dad was in the airforce from 70-74 (in his early 20s) and I'm pretty sure this is the concert he went to as he was stationed in Vegas for a year or 2. He talked about how there were big concerts just about every week at the convention center. Anyway, he told me Yes was the loudest concert he went to, he said it was too loud. 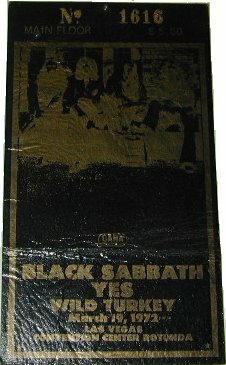 It's pretty cool to see these archived Yes tourdates. Great band!! I was about 20 yrs. old at the time,yes lifted the place to another plane of rapture,only to be brougt harshly down by the stark reality of an inferior black sabbath,I've never seen people leave in groups of tens and twenties like that..before or since..trying to get away from sabbath's mistake of letting yes play before them.. 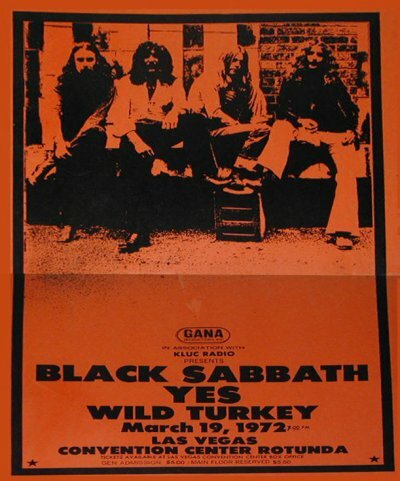 It was Wild Turkey/YES/Black Sabbath at the Convention Center. They were awesome and I really had trouble adjusting to Ozzy and crew after YES.